To reserve your room online click here: Special Conference Rate [omnihotels.com]. Government Room Rate: $164 – A government issued photo ID must be presented upon check-in to receive the government room rate. For the government room rate, please click where prompted. Rates are for single/double occupancy. To make your reservations by phone call 1-800-THE-OMNI (843-6664). Rooms are limited so make your reservations as soon as possible. Rooms will be available until April 1st. Only a limited number of government rate rooms will be available on a first-come, first served basis. Be sure to reference the AIM/FSMB Annual Meeting when booking your reservation to secure the conference rate. This information can also be found on the FSMB website (https://www.fsmb.org/fsmb-annual-meeting/registration-and-lodging). Registration includes entry to the AIM Awards Luncheon and all meeting sessions. Please click on the links below to nominate your choice for the 2019 AIM Service Award and AIM Board Award. Member boards have a maximum of 3 free registrations. Registrations more than 3 are $150 per registration. All Non-Member registration rates are per registration. · Speaker: Catherine Caldicott of Professional Boundaries, Inc. Learn more about Education Programs offered by AIM including our newest licensure program! · Business Meeting (will be moderated by AIM Officers): Please note that in addition to annual business meeting items, we will also be holding elections to fill any vacancies. · Roundtable for networking (will be Moderated by Anne Lawler): Part of the value of every AIM meeting is the opportunity to make use of the collective wisdom of those in attendance. In this session our moderator will help us ask the hard questions, make us comfortable sharing our opinions, and will guide us toward a solution for the tough questions we are faced with every day. Program Materials Attendees are encouraged to bring a fully-charged laptop computer or other electronic devices with them to the meeting, as program materials and presentations for this year’s event will be provided electronically. Attendees are also encouraged to download the FSMB Annual Meeting mobile app to their smartphone or tablet. The app will be available for download in early April 2019. To the hotel, Dallas/Fort Worth International Airport (DFW) is about 25 miles and Dallas Love Field (DAL) is approximately 35 miles. Taxi and shuttle service are available from both airports. Locate the phone bank near the Visitor Information Center in the baggage claim area and press the “Ground Transportation” button and then the “Super Shuttle” button. Then, pick up the phone, press the “Call Now” button, and wait 5-6 seconds for the system to dial and connect you directly to dispatch. Your reservation can then be activated using your confirmation number or you can book a ride if you have not already done so. Dispatch will provide instructions on where to meet the vehicle. Fares are approximately $18 per person each way. Choose taxi service, which is available on the upper level of Terminals A, B, C, and E, and on the lower level of Terminal D. The cost of one-way service to the hotel is approximately $55-$60. If you are flying into Dallas Love Field, you may choose taxi service, which is provided on the upper level at Baggage Claim for Terminal 1 (United Airlines, Continental Airlines, Delta Airlines, and Seaport) and on the lower level of the Main Terminal for Terminal 2 (Southwest Airlines). Fares are approximately $70-$80 each way. If you are driving, on-site valet parking is available for $25 per day. Self parking is available in the city- operated garage adjacent to the hotel for $15 per day. The garage entrance is on 11th Street between Houston and Throckmorton. Please see the front desk for details upon check-in. 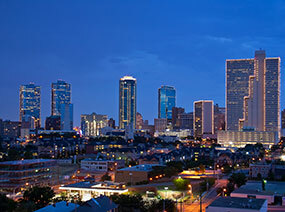 Famous for being “Where the West Begins”, Fort Worth offers a unique mix of entertainment and attractions. The Omni Fort Worth Hotel is near downtown’s most famous venues, including the Fort Worth Stockyards, Sundance Square, and the Cultural District, as well as a host of other places to see in the area. Registration for, attendance at, and/or participation in the 2019 AIM/FSMB Annual Meeting constitutes acknowledgement by the registrant/attendee/participant that photos and video/audio recordings may be made of the conference events and constitute agreement by the registrant/attendee/participant that Administrators In Medicine (AIM) and the Federation of State Medical Boards (FSMB) may use and distribute in its publications, on its web site, and in the conference proceedings, such photos or recordings that include the image or voice of the registrant/attendee/participant. Individual recordings (audio or visual) of any portion of the meeting are strictly prohibited without the prior written consent of AIM & FSMB. By participating in the Annual Meeting, the registrant/attendee/participant acknowledges that he/she agrees to these stipulations.